Senator Karl Rhoads, Chair of the Senate Judiciary Committee, said that these bills are critical for protecting the rights of children and ensuring a long incarceration does not make matters worse. "Everyone deserves constitutional rights regardless of their age," said Sen. Rhoads. "These bills need to become law to protect our children." Rep. Mizuno said that according to juvenile brain and behavioral development science, children's brains are not fully developed, and they are therefore more immature and impulsive than adults, more susceptible to peer pressure, more likely to engage in risky behavior, and less likely to think through long-term consequences of their actions. 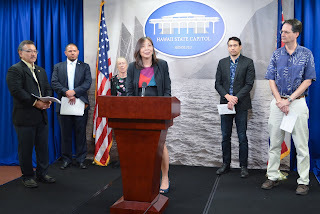 "We do not allow children to vote, enter into contracts, work in certain industries, get married, join the military, or use alcohol or tobacco products," said Rep. Mizuno. "These policies recognize that children lack solid decision-making abilities. But one area where we don't treat children differently than adults is in our criminal justice system where we have been too quick to discard child-status and throw children to the mercy of a system that was never designed with them in mind." James Dold, founder and president of Human Rights for Kids, a Washington, D.C.-based non-profit organization dedicated to promoting and protecting the human rights of children in the U.S. and around the world, said the younger a child is, the more likely they are to give a false confession. "According to the National Registry of Exonerations, in 2017, 38 percent of all persons under the age of 18 gave a false confession: 30 percent of those aged 16-17 falsely confessed, 58 percent of those aged 14-15 falsely confessed, and 86 percent of children under 14 years of age falsely confessed," said Dold. The Supreme Court found that that "only a relatively small proportion of adolescents" who engage in illegal activity "develop entrenched patterns of problem behavior." Representative Chris Lee, Chair of the House Judiciary Committee, said lengthy periods of incarceration expose minors to significant negative influences and can severely interfere with their ability to learn from their misdeeds and develop into lawful members of society. "Children and adolescents are generally more easily influenced by peers, less able to fully understand the consequences of their actions, and more responsive to rehabilitation than fully mature adults," said Rep. Lee. Representative Joy San Buenaventura, Chair of the House Human Services & Homelessness Committee, said by passing these bills the Legislature is giving judges a discretionary tool for when they pass sentence on juvenile offenders. "This goes toward justice reform. We want to make sure that those incarcerated, need to be incarcerated and that judges take into account their age," said San Buenaventura. The bills now cross back to the House, where they will be agreed upon or sent to Conference Committees.